Wearable tech is a gift to gesture controls. For the smart home, especially, it just makes sense. You don't need to stand just so in front of your computer or TV or fridge for it to recognise your waving. If your smartwatch is tracking movements, not a camera, you can be anywhere. In return, this new special relationship could also end smudged touchscreens on smartwatches. For VR and AR too, it brings your body into the picture in a way that millions of pixels never will. This week, the latest Android Wear update brought improvements to its existing gestures - they are not all the most practical, though. For instance, to exit an app to the watch face, you hold your arm out and shake your wrist quickly. 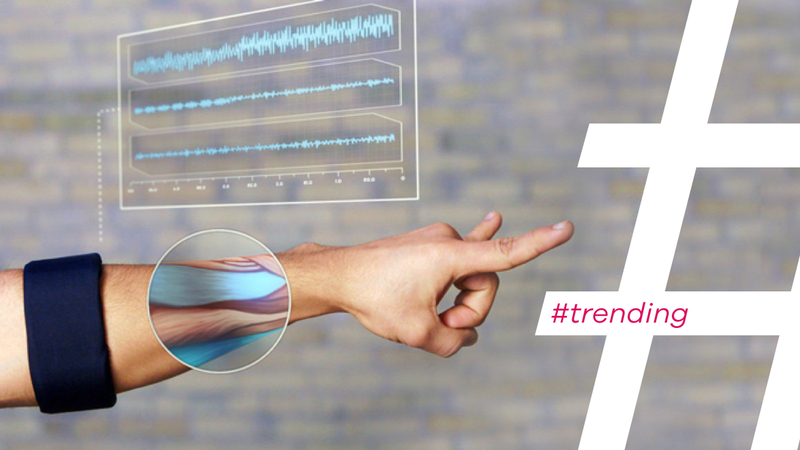 And recently, a man was able to control his prosthetic arm with gesture controls thanks to a Myo armband. Here's how you can get your gesture control kicks right now and what to look forward to next. One of a bunch of successfully crowdfunded Pebble Time Smartstraps, Aria is the work of Alfredo Belfiori, founder of Deus Ex Technology. Also available as a Smart Clip for Android Wear, it cleverly uses tendon analysis to track what movements your fingers and wrists are making. So you can control your smartwatch, smartphone or other Bluetooth devices with up to 20 subtle, personalised gestures like touching a finger to your thumb or clicking your fingers. From the early images, it looks pretty sleek and Belfiori is confident that his algorithms can work with our very human, imprecise movements. Kickstarter units ship in June but both versions are up for pre-order now. We've seen a bunch of patents for gesture controlled smartwatches lately, following Disney's crazy prototype which can identify what you're touching. One of the most exciting is what Google is working on: a smartwatch which transmits a radar beam in which you can create gestures to interact with immersive games or replace your TV remote. It's all sounds a way off, yet, but it feeds into our smart home dream of only needing one wearable to turn us into an all commanding universal remote, conducting our gadgets and appliances like Mickey Mouse in Fantasia. We're listing possible IFTTT recipes as we speak. Now, we're not against the idea of Neyya - using the surface of a connected cocktail ring to control smartphones and computers as a first step towards gestures. But the smart ring is simply too chunky - both the ring band itself, which makes it uncomfortable to wear, but also the 'stone' which acts as a touchpad. It handles alerts as vibrations and can, for instance, launch Siri if you press down for three seconds. The second gen Neyya needs to be more wearable or perhaps relaunch as a bracelet or badge where the surface area would make more sense.